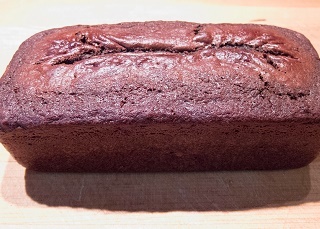 This fantastic Double Chocolate Loaf Cake combines two of our favourite things in life - Chocolate and Cake! So as you can guess, we are extremely excited to share this brilliant cake recipe with you and have a go at making it ourselves! It's been a while since we've shown you a recipe that uses one of our great loaf tins and what better way is there to make up for it than with a loaf cake? We imagine quite a lot of you are getting your summer bodies ready, so a double chocolate cake perhaps isn't the most ideal recipe but sometimes you've got to ditch the diet for a day and treat yourselves, and this cake certainly is a treat! This delicious recipe can be found on the BBC Good Food website, and the image is from Chris Lott (view original version here). Step 1 - Line your tin with baking parchment and heat your oven to the correct temperature: 160C/140C Fan/Gas Mark 3. Step 2 - Beat the butter and sugar with an electric whisk until light and fluffy. Step 3 - Beat in the eggs, flour, almonds, baking powder, milk and cocoa, until smooth. Step 4 - Stir in the chocolate chips, then scrape into the tin. Step 5 - Bake for 45 - 50 mins until golden, risen and the skewer poked in the centre comes out clean. Step 6 - Cool in the tin, then lift out onto a wire rack over some kitchen paper. Step 8 - Melt the extra chocolate chunks separately in pans over barely simmering water, or in bowls in the microwave, then use a spoon to drizzle each in turn over the cake. Step 9 - Leave to set before slicing. Here's a sweet and zesty cake to tingle your taste buds! Perfect for a summer party, this Zesty Lemon Chiffon Sponge is the ideal choice for a tea party centerpiece, which should come in handy with garden season approaching. While the recipe calls for a tube cake tin, such as our bundt cake selection, you could always swap this for a regular sponge shape, depending on your preference (and desire to show off). Step 1 - Preheat your oven 180 degrees (gas mark 4). Step 2 - In a large bowl, combine the flour, baking powder, salt and 100g of sugar. Add the oil, egg yolks, water and lemon zest, then beat with an electric mixer until smooth. Step 3 - In a clean bowl, beat the egg whites and cream of tarter until the mixture forms peaks. Gradually add in 150g of sugar and beat until stiff and shiny. Step 4 - Fold a third of the whites into the cake mixture, then quickly fold in the rest until there are no streaks. Step 5 - Add the mixture into your cake tin, and bake in a preheated oven for 60 mins, or until a skewer comes out clean. Step 6 - To make the filling, heat the flour, caster sugar, orange juice, lemon juice, orange zest and egg, over a medium heat. Step 7 - Cook the mixture until thickened, then allow it to cool completely before folding in the whipped cream. Step 8 - Once the cake is fully cooled, carefully remove it from the tin, and slice it into three, equal layers. Step 9 - Fill each layer with the cream filling, before adding the rest on top, and decorating with either lemon slices or zest. 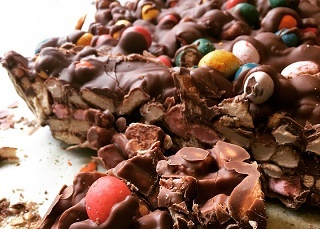 Bored of making the same old rocky road bars and want to mix it up a little? Why not have a go at making this delicious Rocky Road Tart! Somewhere between a cheesecake and chocolate traybake, this delightful tart has an incredible mix of textures and savoury-sweet flavours, making it perfect as both a dessert or as a treat with tea. One of the best parts about this bake, is that it can be adapted to your own tastes and preferences! If you're not a fan of the toppings, simply add your own to create a bespoke kitchen creation that you and your family will love! This mouth-watering image opposite was taken by Charles Schiller, and the original recipe can be found on the Martha Stewart website. Step 1 - Preheat your oven 180 degrees. Ground your biscuit, sugar and salt in a food processor (or crush will a rolling pin). Step 2 - Transfer the crumbs to a bowl and combine with melted butter. Step 3 - Pour the mixture onto your tart tin, then press down the crumbs on the bottom and sides with your hands (or a glass) for form an even layer. Step 4 - Bake your crust for about 15 mins, until the crust turns golden brown. Leave to cool on a wire rack. Step 5 - Melt 300g of chocolate in a heatproof bowl, while bringing the cream to a simmer in a medium saucepan over a high heat. Step 6 - Remove the cream from the heat, and whisk a 1/4 cups worth into the beaten egg yolks, before whisking this mixture with the rest of the cream. Step 7 - Whisk the cream mixture with the chocolate, and set aside. Step 8 - Chop the remaining chocolate, and transfer to a bowl with the marshmallows and almonds, before scattering over the crust. Step 9 - Follow by pouring over the chocolate ganache mixture, reserving 1 cup for topping. Refrigerate the tart for around an hour, or until it is firm, and cover the remaining chocolate ganache at room temperature. Step 10 - Once the tart has set, gather together the remaining toppings, before sprinkling them over the tart filling. Then, drizzle over the remaining ganache, before refrigerating the tart for another 10 mins. Step 11 - Remove the tart from the tin and cut into slices. Think that it's time to put the roasting tin away now that we're heading for warmer months? Wrong! You can still make fantastic use of your tins during the spring/summer seasons, simply by swapping warm, comforting spices for colourful veg and zesty flavours! 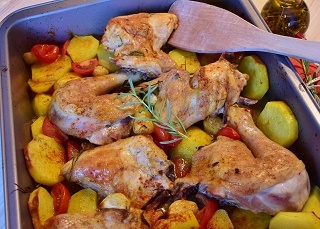 This chicken and potato recipe is the perfect alternative to your standard family favourite, and will certainly be a welcome addition to your plates when you serve them up. The flavours of the garlic and bay leaves blend beautifully with the sharp hit of lemon, creating a dish that will leave everyone asking for second helpings. Step 2 - Pour olive oil into your roasting tin and add the potatoes, olives, lemon quarters, bay leaves and garlic. Step 3 - Toss everything so that it is evenly coated in oil, then add the chicken thighs skin side up. Step 4 - Place in the oven and cook for one hour, basting with the juices in the pan halfway through. Step 5 - At the end of the hour, check that the potatoes and chicken are cooked through, before returning to the oven for another 15 mins to crisp the chicken skin. Step 6 - Once you've removed the tin from the oven, press down on the garlic cloves to remove them from their skin, then mix the mashed garlic with the rest of the juice. Step 7 - Serve your dish with a fresh, leafy side salad.